Mild, dry and rather pleasant evening saw Dave & Lesley, Jack and Mark to the Scolty monument and back. Final arrangements for the last few members squeezing into the Crathes Half in three weeks time. Evenings like this were made for running. What a pleasure to run though our forest with Helen, young Lesley, Emma, Lesley, Paul, Jack and Mark M. Seven and eight km routes utilised. Lesley, John, Mark M and Emma took to the riverside route on a “out ‘n back” routine with the turn point agreed at 7pm which was 23 minutes into the run. Very wet all day didn’t deter keen runners young Lesley, Ali, Wendy, Bill, Lesley, Jack, Chris, Mark M and for the first time Emma joined us. Welcome aboard and happy running in Banchory. Well, there you were having a long Saturday morning lie-in. Your other half just brought you your tea, toast and the p&j. Outside in Banchory the rain is teeming down and you never imagined for a minute that we (Lesley and Bill) were basking in bright sunshine and warm breezes as we ran up Kerloch this morning? Well you were right not to because it was teeming down there too, all overlaid with a healthy dose of scotch mist! Still, and to be fair, the rain was somewhat warm. We made the top in double quick time and headed down just as quickly having taken in the magnificent views of, well, rocks and some very interesting lichen as it was a pea-souper and the rain had gotten even heavier. The heavily eroded path up and for about three miles down the other side finally convinced me that we need to delete this one from the programme. Not only is it dangerous but we are, after all, a running club and with long sections un-runnable it just doesn’t tick the boxes. Still, after the bad bits it was good running, and in places wading up to ankle deep, all the way back to the road and thence to the holy grail – coffee and an enormous home made scone topped off with butter and home made raspberry jam at Knockburn Cafe. Fit fine! Next up on Saturday 5th September, and in a change to the schedule published on our website, is our run round Loch Muick, which we had to abort earlier due to lack of numbers. I need to know in advance for this one for the car share. See you then if not before! A dash to top of Scolty on a warm sunny evening for Bill, Lesley, Mark M and Rick. We really are most fortunate to have the magnificent gardens of Crathes to use as our own. As it happens, most opted for the 10km option using the Deeside Way and quiet roads surrounding the estate. Others made use of the 8km and 5km routes. The run was shared by Fred and Jenny, Chris, Jack, Mark M and Mark C. Then there was Rob, Jan, Lesley and Paul too. The run was closely followed by a round of drinks at Scot Skinners and the club enters the 4th year. 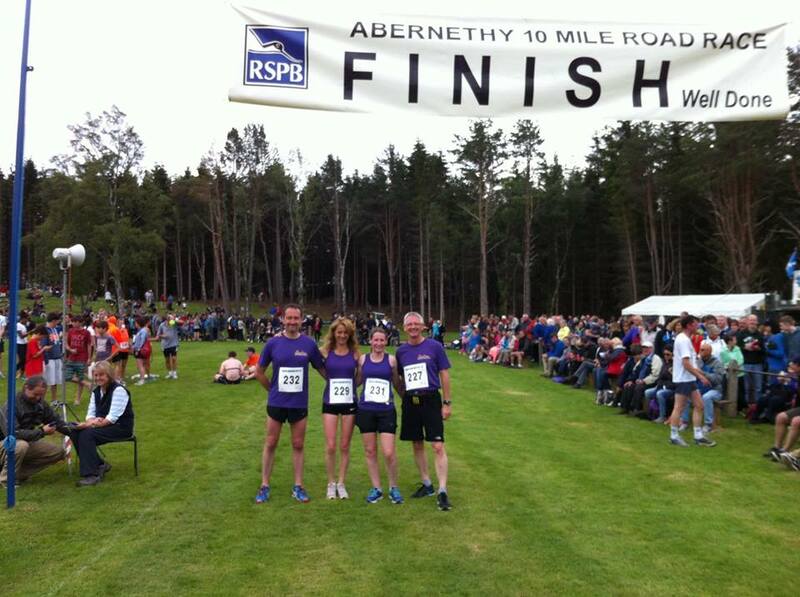 The Banchory Running Club team, consisting of Mark, Kerry, Lesley and Bill, enjoyed a great run through the Abernethy Forest against stiff competition on Saturday and come in with an aggregate time of 5hrs 33mins for the 10 mile course (that’s 10 miles each ok?)! Not sure yet what time the winning team had but we were definitely in the top ten…..of maybe five teams. Still a very creditable performance with everyone under 1hr 30mins. I for one was chuffed. Weather was good and course pretty fast, and it was great to be part of much bigger event – the Abernethy games, and if we get the chance it would be good to have an even bigger team next year. Today saw a gentle 5km run as Lesley prepares for the Abernethy Team event and Jack recovers from migraine. There really is a run for all reasons and seasons. What a great sport this is and Deeside is a real running haven with countless traffic-free runs through stunning scenery. Mild and dry conditions allowed for a pleasant evening run with Bill, Jan, Jack, Dave & Lesley, Wendy, Mark M and Gordon with Sky.